The new film, directed by Asif Kapadia, reviewed. 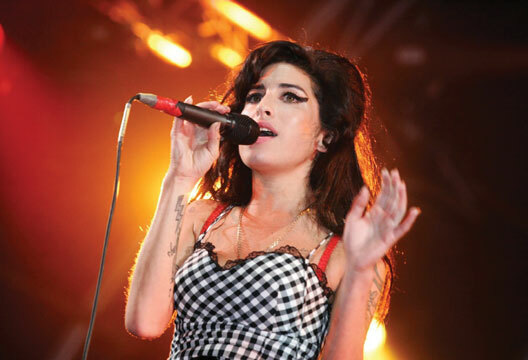 This documentary film – comprising extensive archive footage and early family video, interviews with some key players and films of her performances – charts the rise and fall of the singer and songwriter Amy Winehouse. In every sense this is a real tragedy. Although you know it will end in her untimely death at the age of 27, like all tragedies it is the inevitability that totally absorbs the viewer. The film makes you realise just how talented Amy Winehouse was as both a singer and writer, as she progresses from school to college to recording success. It also shows the extent to which she was exploited by those around her and let down by others close to her, including her parents. It was her parents’ split when she was nine years old that appears to be a key moment. Her mother Janis lacked the assertiveness needed to keep her on-track and her father Mitch, who she adored, seemed at times to have his own agenda when all she needed was a hug. Like all films it has its heroes and villains. The villains include the boyfriend and husband Blake Fielder, and Amy’s management in her later years; the heroes her teenage friends who stuck with her through hell and high water, and one of her bodyguards who comments: ‘The trouble with Amy is that nobody has ever said no to her.’ It is this absence of ‘tough love’ that lies at the heart of this film and Amy’s decline. Another hero, surprisingly, is the singer Tony Bennet. We learn that she is in awe him from an early clip when he presents her with a ‘Grammy’. Later he asks her to sing a duet with him on what was to become her last recording. He treats her with a charm, sensitivity, dignity and love and was able to bring out the very best in her. It is a pity others in her life seemed so incapable of similar behaviour. Psychology, while not being a hero, does come out of the film well. The reasoned refusal of colleagues not to admit Amy and her boyfriend into rehab as a joint deal speaks highly of those who refused to collude with Fielder and his apparent agenda. Yet it is clear that the delay in her receiving appropriate treatment early enough was a missed opportunity that changed the course of her life. As she sang in the song; ‘They tried to make me go to rehab: I said No No No’. This film is compelling, absorbing and at times shocking. Whether you liked her music or not this is a film not to be missed.